I am have now been back a week from my recent trip which included the Urban Sketchers Symposium in Lisbon – what a blast! Will have to get a group of Sydney Sketchers to go to the next one! I am even more enthusiastic about sketching on location as a result...and so the first full Saturday I went out into the city. 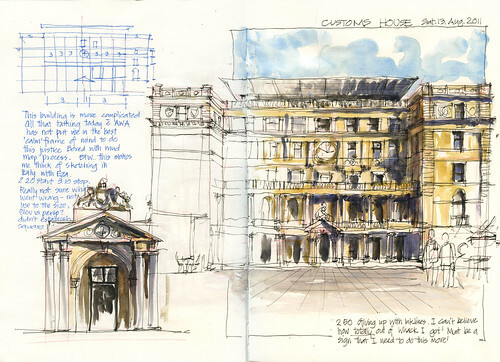 My big post-Lisbon goal is to make time to do more serious architecture sketches in Sydney so here is Custom House. I have been inspired by others at Lisbon who work larger Florian, Gerard, Eduardo, Marc etc and also seeing the amazing pencil sketches of Katherine Tyrrell (done in an A4 moleskine) when I met up with her in London the week after the symposium....so I have got a new A4 size sketchbook. The new size is wonderful...but I did get a little bored by the sketch at the end of it because I got into a big of a mess with the setout of the building... but hey - I still had a lot of fun splashing the paint around!!! Check out my blog post for the other things I got up on Saturday - including my sketch of 3.5 hours in the sun drinking tea and eating scones, buying more art supplies and getting into trouble with the security guard on the Harbour Bridge.